Madame Tussauds Orlando has rolled out the red carpet for its newest celebrity wax figure with the arrival of Pharrell Williams, 11-time Grammy Award winner, singer, producer, fashion designer, and coach for NBC’s The Voice. Pharrell is styled in the same outfit he wore when he received his star on the Hollywood Walk of Fame (including a jacket from his own brand, Billionaire Boys Club). The figure is featured inside the music room of the new wax attraction. 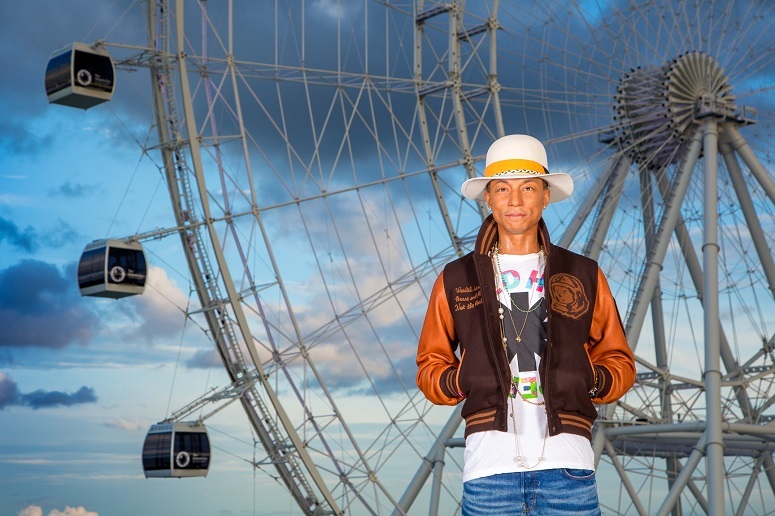 Pharrell’s first figure was unveiled earlier this year at Madame Tussauds New York, styled in his infamous Vivienne Westwood mountain hat from his performance at the 2014 Grammy Awards. Madame Tussauds artists and sculptors spent months on research to create the most accurate representation of the Happy and Get Lucky singer. PThe music industry has honored Pharrell with 11 Grammy Awards (including 2004’s and 2014’s Producer of the Year) and the ASCAP’s prestigious Golden Note Award in 2012. Billboard named him Producer of the Decade in 2010. He also received a 2014 Academy Award Nomination for his original song Happy, featured in the animated film Despicable Me 2. Madame Tussauds is world-renowned for the creation of detailed and lifelike wax figures. Each figure is truly a work of art, involving teams of professional artists and sculptors who spend months on extensive research and take more than 300 measurements to recreate world-famous icons, to achieve the kind of astonishing realism that has been at the heart of the 250-year Madame Tussauds legacy. Guests at Madame Tussauds Orlando will experience the essence of America with this brand new, immersive and interactive wax experience, bursting with family fun and world-class entertainment, as they move through themed areas meeting all of their favorite stars from award-winning film actors, to historical and modern world leaders, sports stars, music legends as well as figures important to Florida. For more information, visit www.madametussauds.com/orlando. PHOTOS: © 2015 Merlin Entertainments Group. All Rights Reserved.